Samsung is yet to release the Android 6.0 version of its software, so the Samsung Galaxy A7 (2016) launches with Android 5.1.1 Lollipop. TouchWiz has been streamlined, but still adds plenty to the Android experience. You still miss out on things like fine-grain app permission control, though. The phone features a capable fingerprint reader, which is, of course, available for securing the lockscreen. It's quite fast (as fast as the S6), especially if you wake the phone with the Home key - all it takes to unlock the phone is to leave your finger resting on the key for an additional split second. This makes using the sensor and its security benefits seamless. The homescreen is the standard TouchWiz base of operations, which includes the Briefing pane. It's basically Flipboard in disguise (and can be disabled if you don't like it). The software is essentially the same as the A5 (2016), except the Galaxy A7 fits five columns of shortcuts instead of four. The Notification area features a row of quick toggles. S Finder and Quick connect buttons are enabled by default, but you can hide them to free up more space. Themes are fully supported and there are even A-series exclusives. Themes change wallpaper and icons and modify the look of some stock TouchWiz apps. 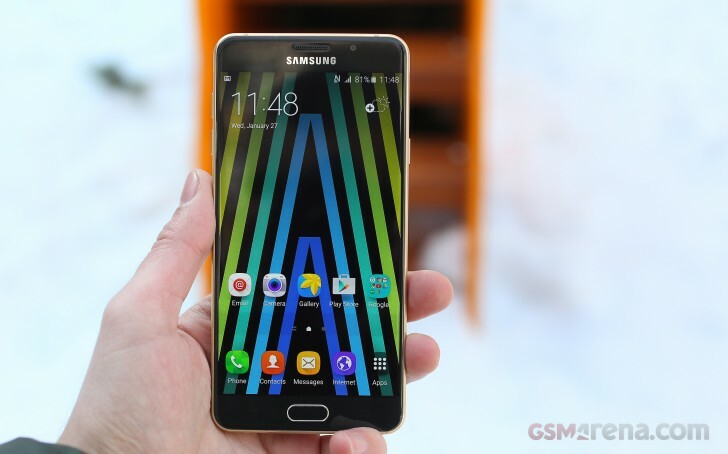 The Samsung Galaxy A7 (2016) comes with an average amount of apps pre-loaded. The built-in storage (16GB) doesn't leave much room - the user-available memory is around 11GB. Good thing you can pop in a microSD card. The new Galaxy A7 also offers split-screen multitasking. The 5.5" 1080p screen has enough room for two apps to live side by side. In this mode, you can chat with two friends at once or reference a document while writing an email. Not all apps support this split view, but all of the key ones do. The option to put an app in a floating window is not available.